A single tweet has never harmed anyone but this tweet may beg to differ. "It is time. 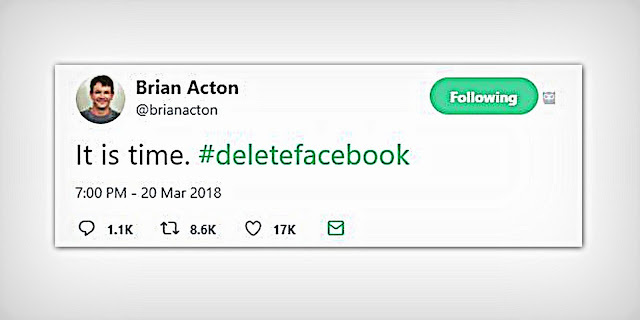 #deletefacebook" tweeted by Whatsapp Co-Founder Brian Acton 19 hours ago may seem to be simple in nature, but it has spread like a wildfire nevertheless through the Silicon Valley and worldwide. If you jog your memory, nearly 3 years ago, Jan Koum & Brian Acton sold Whatsapp to Facebook itself for a valuation of $19 Billion ($5 Billion in Cash & $14 Billion in Facebook shares). The tweet came after five dreadful days for Facebook with regulators swarming and its stock price plunging to depths following concerns over data privacy. U.S. Federal Trade Commission (FTC) who is reported to be investigating Facebook closely as it was revealed that 50 million users' private information was misused by a political consultancy firm. The consultancy firm at the center of everything is Cambridge Analytica (CA), which was hired by the Trump campaign in the 2016 U.S. presidential election, has been accused of taking the personal data unknown to users. CA, based out of London, has denied the rumors. However, the Trump campaign paid the firm a total of $5.9 million, according to Federal Election Commission (FEC) data processed by the nonprofit Center for Responsive Politics. The campaign's filings say the firm provided data management and survey research. But estimates for how much the data is worth, as processed by Cambridge Analytica, run much higher. On Tuesday (March 20) late-night, a proposed class-action complaint filed by Lauren Price, a Maryland resident, is the first of what could be many lawsuits seeking damages over Facebook’s ability to protect user data, and CA’s exploitation of that data to benefit Trump's 2016 campaign. A day earlier, Facebook said it had hired forensic auditors from the firm Stroz Friedberg to investigate and determine whether Cambridge Analytica still had the data. The complaint was filed by John Yanchunis, a lawyer for Price, in the U.S. District Court in San Jose, California, several hours after Facebook was blamed in a shareholder lawsuit filed in nearby San Francisco for the drop in its stock price after the data harvesting was revealed. Nearly $50 billion of market value was wiped out in two days. Christopher Wylie of Eunoia Technologies, Inc., who previously has worked with the consultancy firm, alleges that it acquired a large amount of data through a harmless personality prediction quiz on Facebook called "thisisyourdigitallife", which was developed by Dr. Alexander Kogan of Cambridge University and billed itself on Facebook as "a research app used by psychologists." Almost 270,000 people took the quiz on the social media platform, but the data of some 50 million users, mainly in the U.S., was extracted without any explicit consent via their friend networks. This data was then sold to SCL/CA (which has been identified by Facebook as a firm that does political, government and military work around the globe), which then manipulated it to profile people according to their political inclination and deliver pro-Trump material to them, with a clear eye to influencing the outcome of the 2016 election. CA insists it followed the correct procedures in obtaining and using data - but it was suspended from Facebook last week. However, further allegations about the firm’s tactics were reported late Monday by British broadcaster Channel 4 which said it secretly taped interviews with senior Cambridge Analytica executives in which they boasted of their ability to sway elections in countries around the world with digital manipulation and traditional political trickery. Meanwhile, at Facebook HQ, Employees at the company were addressed this morning not by the management, but by one of the company's top lawyers. A Facebook spokeswoman said both Mr. Zuckerberg and his deputy Sheryl Sandberg were too busy to address staff themselves. Both Zuckerberg and Sandberg have drawn criticism for their silence over the issue. However, lawyers said, Facebook has suspended the firms and researchers involved and further added, "the data had been misused but not stolen because users gave permission". Coming back to Brian Acton, who sold off nearly about half of his Facebook shares worth $3.2 Million back in late 2016, did not immediately expand on his comment. His Facebook profile was still active for few hours after his tweet but deactivated late on Tuesday night. After staying on for three years, Acton quit Facebook/Whatsapp in September 2017 and is now a major investor rival messaging service Signal, which boasts encryption to make its messages resistant to government surveillance. In February, he joined the newly launched nonprofit Signal Foundation as executive chairman and invested $50 million into the app. Signal & Signal foundation is backed by Moxie Marlinspike, founder of Open Whisper Systems and well-known privacy Pariah. The power of a single tweet is either enormous or a dud. But, it all depends, who has tweeted it in the first place. And, this time its Brian Acton! Kevin Simon (ORCID: 0000-0002-2962-8008) is a Marketing Professional at Cognitio Innovo, with a keen interest in Technology, Business & Sports updates worldwide. He is graduate in management studies (MBA) from the Institute of Management, Nirma University, Ahmedabad.